Best White Label SEO & Referral Program in Canada! Best White Label SEO in Canada! We have the highest paying referral program and best Canadian white label pricing on the internet! Just for sending us a client! You don’t have to even have to press a key! We do it ALL! 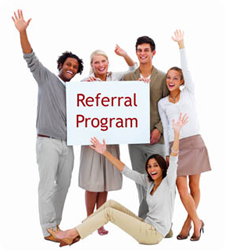 Why do we offer the highest paying white label and referral program on the Canada Internet? Simply put, we want to make it worth your while as a new client or to show our appreciation as an existing client. This is why we have the highest paying referrals. All you have to do is contact us with your referral’s first name, company name and email and get then to mention your name in the initial email and upon your referral’s payment confirmation we will send you your referral fee via Pay Pal. All you have to do is call us directly and we will set you up a monthly, automatic Pay Pal payment and get the client to fill our one of our “company details” document and its as easy as that. If your client has any questions at all we have live chat with your brand name on it to make sure your clients are feeling secure and you get a copy of the chat email directly to your email! All Referral Fees a subject to the LAWS posted on THE LAW SOCIETY OF UPPER CANADA website. Referrals can not be taken off your payment and can only be transferred via Paypal.